Edmon Chung, CEO of the DotAsia Organisation speaks at the press announcement of .Asia's DNSSEC signing. Dr. James Galvin of Afilias gives the history of DNSSEC during the press announcement of .Asia's DNSSEc signing.This week, at the 79th Internet Engineering Task Force (IETF) meeting in Beijing, China, Afilias and DotAsia jointly announced that Domain Name System Security Extensions (DNSSEC) has been enabled for the .ASIA top-level domain. The signing of the .ASIA domain enhances global security and reinforces .ASIA's commitment to become the Internet identity for businesses from Asia as well as those expanding to Asia. 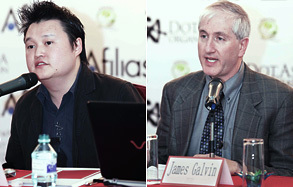 "The .ASIA domain is now alongside other industry leaders such as the .GOV TLD in being some of the first TLDs to enable DNSSEC," said Dr. James Galvin, Director of Strategic Partnerships and Technical Standards for Afilias. "Afilias is pleased to be able to provide our DNSSEC expertise and technology to our customers, especially .ASIA, which has proved a useful and meaningful domain across the Asian region." Speaking at the launch ceremony in Beijing, Edmon Chung, CEO of the DotAsia Organisation, was delighted that the deployment of DNSSEC is now a reality for .ASIA. "DotAsia has always put security and stability of the Internet as a top priority for our community. The implementation of DNSSEC furthers our commitment to foster a safe and secure environment for ecommerce to prosper in Asia. The .ASIA domain enhances Search Engine Optimization (SEO) for users coming from Asia as well as those looking for information in Asia from around the world. With DNSSEC, the identity of domains can be further secured to protect businesses and Internet users transacting on .ASIA domains." DotAsia Organisation is a regional not-for-profit organization with a mission to promote Internet development and adoption around Asia. DotAsia oversees the ".Asia" top-level Internet domain name, and is formed as an open membership consortium of official domain authorities around the region, including .CN (China), .JP (Japan), .KR (Korea), .IN (India), .NZ (New Zealand), .PH (Philippines), etc., and regional Internet organizations including APNIC, APNG, APCERT, PAN and APTLD. DotAsia has a core mandate towards digital inclusion, education and research and development. For more information on DotAsia please visit http://www.registry.asia/. Local Time: Thursday, April 18, 2019 05:54 AM PDT – Page Load: 0.3048 Sec.